The Senate Education Committee was marked by a somber tone Tuesday as lawmakers held their first hearing on school safety proposals since the mass shooting at Santa Fe High School that left 10 dead and another 13 wounded. Representatives from schools affected by gun violence spoke in a room that seemingly grew more quiet and attentive as their testimony went on. “When a high school student tells you that this is just — in their mind — a product of the time they’re growing up in,” said Rusty Norman, president of the board of trustees at Santa Fe ISD, “there’s just something fundamentally wrong with that." Lawmakers and members of the public present in the committee room gave Norman and other school leaders a standing ovation for their response to the shooting. At Tuesday’s committee hearing — which ran for roughly eight hours — lawmakers laid out a bevy of school safety bills, a top priority for both Lt. Gov. Dan Patrick and Gov. Greg Abbott. Consideration of the legislation came almost a year after the Sante Fe shootings. Proposals included altering an existing state-sanctioned program to arm teachers and a sweeping measure that would expand emergency training and threat assessment teams in Texas schools. Gun control wasn’t a topic of consideration at Tuesday’s hearing. Instead, lawmakers spent the bulk of their time discussing what could be done to prevent — or at least mitigate — the next mass tragedy. The proposals that earned the support of lawmakers of all political stripes included ones to strengthen security and mental health initiatives in schools. “We have to have the threat assessment and we have to have the mental health, or else we’re going to lose this battle,” said Michael Matranga, the executive director of security and school safety for Texas City Independent School District. But panelists on the committee were in a consensus: Texas schools need to have programs in place to ensure a quicker response when school shooting happen, and the Legislature needs to take steps to help prevent those shootings from happening in the first place. Santa Fe “was not just a Texas tragedy. [It] was an American tragedy,” said state Sen. Eddie Lucio, Jr., D-Brownsville. During the hearing state Sen. Larry Taylor, who represents Santa Fe ISD, laid out Senate Bill 11 — a broad school safety bill that would employ mental health professionals in Texas school districts, expand emergency response training for district employees and establish threat assessment teams. Such teams would help identify potentially dangerous students and determine the best ways to intervene before they become violent. “The best thing we can do for school safety is prevention,” said Taylor, who also chairs the committee. Still, he reassured other lawmakers SB 11 was not yet in its final form and that he looked forward to having a “robust conversation” on the measure. That conversation started with the people who knew the tragedy best. Norman, who spoke as a resource witness for the panel, said that after the shooting occurred the high school turned to “hardening” their infrastructure through the installation of metal detectors and other “immediate improvements,” like additional mental health support. “Santa Fe ISD on May 17 thought it was in really good shape when it came to safety and security," Norman said. "We had an incident on May 18. Norman spoke briefly about how the conversation on school safety in Santa Fe varied drastically from the one that occurred at Marjory Stoneman Douglas High School in Parkland, Florida, in which 17 people died. School personnel repeatedly encouraged the Legislature to assist schools financially since, they said, districts cannot rely on grants to help pay for long-term improvements. For the most part, lawmakers were keen on allocating legislative dollars to help offset the cost on school districts. Taylor’s bill appears to take an unspecified amount from the rainy day fund to cover the costs. But at times, lawmakers like state Sen. Bob Hall of Edgewood pushed back at the idea of throwing money at Texas schools. “You cannot put a price on a child’s safety and security,” Norman said. SB 11 and the programs championed by both Norman and Matranga are among a handful of proposals in line with the governor’s 43-page school safety plan that he released weeks after the shooting. 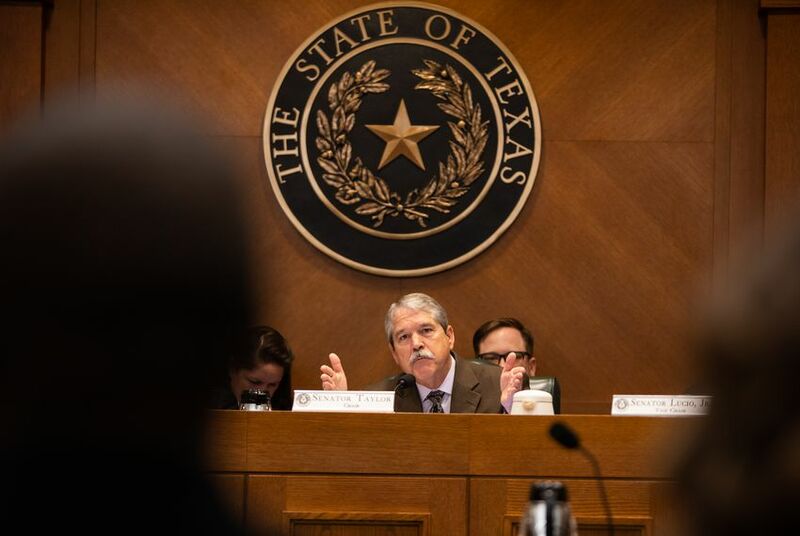 In addition, the panel also heard testimony on a handful of other — much narrower — school safety proposals that have earned Abbott’s support, including three bills that would’ve altered the school marshal program. Senate Bill 243 and Senate Bill 406 by Republican state Sens. Brandon Creighton of Conroe and Brian Birdwell of Granbury, respectively, would eliminate the mandate that trained school marshals, whose identities are kept secret from all but a few local officials, keep their firearms under lock and key. Creighton’s bill, however, has language allowing districts to choose whether they want their marshals to openly carry their weapons. Another bill by Creighton, Senate Bill 244, would eliminate the cap on how many marshals a school district can have.